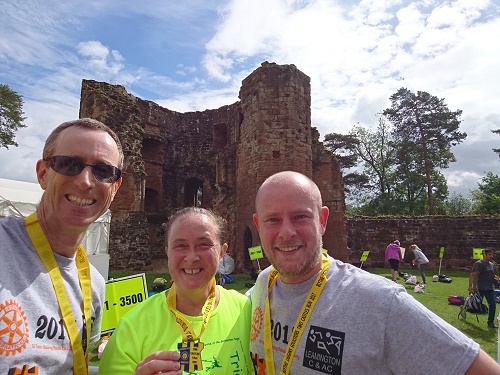 Another of Kokila's "50k at 50" challenge races where I tagged along...so did Kokila's brother, Chris, who races every month at the moment and is looking is good shape! We had good weather for this one and a dramatic start, streaming out of the castle gates on to closed roads through Warwick where I passed Liz & Dave who were out to watch from the roadside. Time-wise I was clocking some 4 minute kilometres to start with but then the hills came and the legs and lungs had to face reality. Final result for me was 42.20, 33rd in category and 175th out of just under 4000 runners. I'll take that - I worked pretty hard for it! This was one of those races where the scenery takes over and the time doesn't matter so much. Great to see both Kokila and Chris in such good shape too.